Thursday September 24th, 2015 was a powerful night in Denver, Colorado. 9 to 5 of Colorado held its Annual Soiree at the City Hall Event Center. There was a silent auction, good food and inspiring speeches as they celebrated over 42 years of winning justice for working women. Masters Memories was there too capturing fun photo booth memories. Property Management at 50 South Steele loves its tenants. They had a tenant appreciation day on Wednesday, September 23rd with great BBQ from Famous Daves and bluegrass music from Silverplume Band. Saturday afternoon under the big white tent, “Once Upon a Child” had their annual coat kick-off event. They had a huge sale in the store as well. There was something for everyone and everyone had a great time. Masters Memories was there to capture some photo booth memories for the happy customers. Saturday night at the Brown Palace in Denver, Colorado Pat and Jackie celebrated 10 years together with family and friends. Between the dancing, drinking and Masters Memories photo booth, the celebration lasted into the night. I was proud to be an American on Friday night at the Garden of the Gods Club in Colorado Springs, Colorado. The Kissing Camels Women’s Club celebrated the United States of America in style with dinner, dancing and a musical salute to America by Lori Rathbun. Josh and Chelsie exchanged vows on Sunday, September 6th 2015 in a beautiful ceremony and reception at Terrace Gardens in Ken Caryl. There was food, fun and dancing into the night as family and friends celebrated their love and commitment. Keenan and April were married Sunday, September 6th at the The Barn at Raccoon Creek. The weather was perfect and so was the whole day and evening. Family and friends ate, drank and danced into the night and sent the happy couple off with a lot of love. Friday night at the Brookside Garden Events Center Conrad and Cherish exchanged marriage vows and celebrated into the night with family and friends. Masters Memories was there to capture many amazing memories and to present a memory album signed by the photo booth guests. 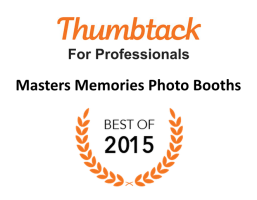 Masters Memories was awarded a “Best of 2015” award by Thumbtack.com. This award is based on the wonderful reviews from my awesome customers. Thank you to all my customers for making memories with Masters Memories this year.